Buy Suma Gram Flour 500g in the UK from our online shop or directly from our independent Scottish store. Gram flour is milled from chickpeas and is widely used in Indian cuisine. These savoury muffins are the perfect entrée to any vegan meal and a real Sheesy treat and just another example of healthy, guilt free nibbles made possible with our dairy free Sheese range. This recipe contains 75g chickpea flour. As official Suma stockist, we sell genuine Gluten Free Flours & Mixes directly from our shop in Scotland and online throughout the UK. Suma is our main supplier of beans, pulses, grains, flours, seeds, dried fruit. It is a cooperative and is fully vegetarian. View more products from Suma. Where can you buy real Gram Flour - Gluten free safely online? If you are wondering where you can buy Suma Gram Flour 500g safely online in the UK, then shop with us. We are an actual health foods shop; with real people selling real foods and products. Our award-winning independent shop is located in Stirling, Scotland since 1976. You can buy our Beans, pulses, grains, flours, seeds and dried fruit and other genuine Gluten Free Flours & Mixes in store or safely place an order with us online or over the phone. 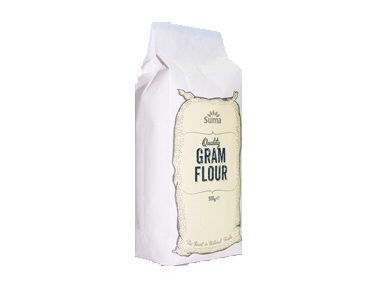 Gram Flour - Gluten free - Suma Gram Flour 500g in Gluten Free Flours & Mixes and Baking.